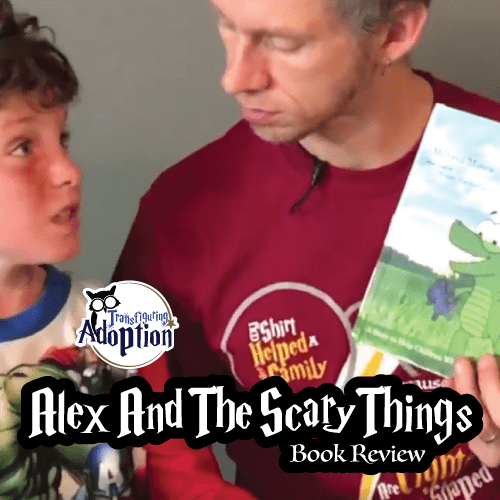 “Alex is an alligator who has experienced ‘scary’ things. In this charmingly illustrated story, he talks about how this affects him and how he copes. Transfiguring Adoption feels that this is book is targeted toward children around the ages of 3 – 10 (pre-school through most of elementary school). While the story is not directly related to foster or adoptive family, it is very much written with children that have suffered trauma in mind. The illustrations are engaging and do a fine job of helping to enhance the content of this story. Readers will notice that the illustrations use a technique in which landscape photography is used in the background of each page while the cartoon Alex is drawn on top of the background. The book appears to expose children and caregivers to different responses children might have emotionally to trauma they have been a part of in the past. This tale will create ways for caregivers and kids to give names to emotional episodes they may have so that they can explain them better. The book will give some activities that families can execute to help children calm themselves and regulate their emotions. The book comes complete with a page written to caregivers to help them understand their child’s situation better and assist them in ways to utilize the book. Do you have the same favorite food as Alex? What is yours? What is Alex’s favorite stuffed toy? What is yours? What scary things might Alex remember? How does Alex know he is The Destroyer? How does he calm The Destroyer? Show an adult how to do this. What happens to Alex when he is Jumbles? How does Alex calm Jumbles? Show an adult how to do this. What is Alex like when he is Alex? What are you like when you’re you?